We’re revisiting some definite warmer-days territory here, but back in Fall we did a small photoshoot and were lucky enough to have Miss Doménica García join us for the day to lend some of her ace dance and modeling skills to the shoot. Truly though, the camera would point at her and she’d swing her leg up in the air to show the width of wide leg culotte pant. Nat-ur-al! This is partial due to the fact Doménica is a trained video and performance artist. Having studied film making at the School of Visual Arts in NYC, which is known of turning out crazy good creatives, her work dives deep into the process of introspection. She blends and explores themes like decomposing the personal and discovering the universal, the juxtaposition of the radical and the ordinary, and strives to give greater significance to the day-to day experience. She’s collaborated with the Ministry of Culture in Mexico City (where she spent her early years growing up and can give some solid mezcal bar recs), had her work installed at the Institute of Contemporary Art in Boston, and had her most recent work Corazón Entristecido, a performance, and video installation, presented at the Queens Art Intervention and the Queens Museum. 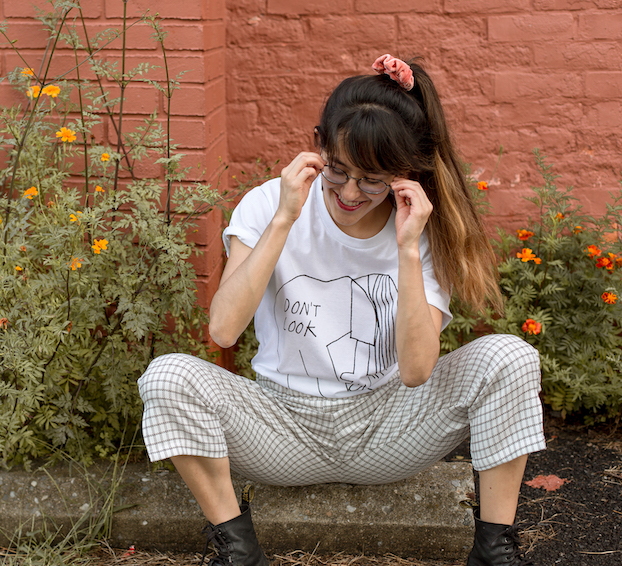 Check out more of Doménica’s work and admire her modeling forte (not to mention the cool clothes sold in our online shop) below! Lamp Assist: Velvet Tee by Earthencolor, Vintage Skirt and Vest by Cross Country Vintage, Earrings by Podobena. Dead serious: Velvet Tee by Earthencolor, Vintage Skirt and Vest by Cross Country Vintage, Earrings by Podobena, Boots by Kenzo (send us email if you want these puppies, they’re consignment, size 6.5). Indigo Tassel Box Top by Mira Blackman, Sonia Culotte Pants by Conrado, Earrings by Witt & Lore, Wall Hanging by Its The Boonies.